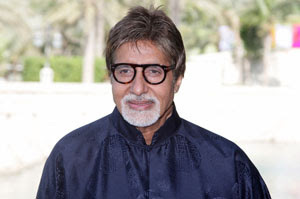 Mumbai: Bollywood megastar Amitabh Bachchan, who is superstitious about watching cricket matches when Team India is playing, couldn't stop himself from witnessing the high voltage World Cup final on TV and remained glued to the screen till captain MS Dhoni smashed the victory shot. "Anhonee ko hooni kar de, honi ko anhonee! Ek jagah jab jama hon tinoh - Rajni, Gajni aur Dhoni!!!!! (nothing is impossible when Rajinikanth, Aamir Khan and Dhoni are present at one place) Me superstitious about watching match because we lose... but after 33 for 2, don't know why sat in front of TV, till the six from Dhoni," he wrote on micro-blogging site twitter. "Diya Ghumake, Ghumake, Ghumake!! (gave a whacking) It's like we just won our independence. Incredible Incredible. Its madness outside." After India's thrilling win against Sri Lanka, like millions of fans across the country, Bachchan, son Abhishek and daughter-in-law Aishwarya came out on the streets to express their joy. "Just back from driving out into the millions on the streets, sitting on the roof of my car with Abhishek and Aishwarya, screaming and waving the Tricolor... unbelievable. We won! We are the World Champions !Yeeeeeeaaaahhh! !," the 68-year-old actor later wrote. Music director-composer-singer A R Rahman said, "Jai Ho, India for winning the World Cup! We are getting all that we want... May we always "want" the best things that build our country as the most noble nation in the world!."